The artist assigned to paint a portrait of someone with brown hair may reach for any brown pigment to represent the follicles in the hope that it will do, the result being the hair looks flat, dull and more like wool than fine strands. How can the artist paint brown hair realistically? Making blanket assumptions about the colour of brown hair, using any tube of oil paint labelled “brown” to represent anything from brunette to auburn. Illustrating every strand of the hair in a linear fashion with a fine sable, resulting in a synthetic appearance that resembles a wig rather than real hair. Allowing harsh dividing lines to remain between tonal areas, making the hair appear solid or plastic rather than divisible strands. Mixing the brown colour with white to represent highlights, or black to darken it, resulting in dirty grey colours. Treating the hair area as a separate entity to the rest of the face, by omitting to illustrate how the hair casts shadows over the brow and cheeks, resulting in a cut out appearance to the brown hair. The observant artist will notice that brown hair is a mere blanket label for a diversity earthen colours, including brunette, ochre, auburn, coffee, toffee, bronze tan, chocolate and russet that require different colour mixes to achieve. 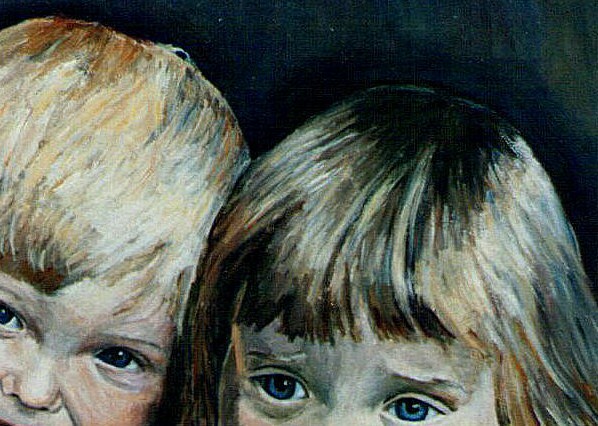 With this in mind, the following remedies may help the artist paint brown hair realistically. Avoid using generic brown paint to represent the whole head of hair. The brown colour will vary between individuals and even between strands. The key to suggesting the soft texture of hair is through blending. Look out for harsh divisions in tonal areas that could draw the eye. Use a soft sable for achieving smooth gradations. Highlights are not merely white, but other colours. Some brunettes exhibit blue highlights, others show pinks, violets and even red. Avoid using black to darken brown hair. Warm brown hair can be darkened with a little pthalo blue and burnt umber; cool brown hair can be darkened with a little ultramarine and permanent rose. There is no need to draw every strand of the hair. It is better to blend the colours of hair and to suggest detail with a fine sable on selected areas of the hair, such as highlights and stray strands. Pay special attention to the outline of the hair, particularly strands that fall over the face or catch the light. Illustrating local shadows over the face can be effective at creating an almost photographic representation of hair and making it look as though it belongs to the subject. Backlit hair will create bright russet colours, pinks, golds and bronzes, with tones similar to bright translucent autumn leaves. Take advantage of these opportunities to create a striking portrait. Lots of browns and earth colours are not needed for every shade of brown. I use burnt sienna, burnt umber, ultramarine, pthalo blue, permanent rose, cadmium red and titanium white for all my brown hair paintings. The portrait artist may find the following pigment mixtures helpful when trying to capture a particular colour mix for brown hair. The pigments are suggestion only, as in real life, more colours will be seen in highlights, reflections and darks. Varying amounts of white will be required in each case to express paler tones. Ash brown hair: burnt umber, a little pthalo blue with white. Auburn hair: burnt sienna, permanent rose and ultramarine. Russet hair: burnt umber, cadmium red and a little ultramarine. Toffee hair: burnt umber, cadmium red and a little ultramarine. Dark coffee hair: burnt umber, pthalo blue and permanent rose. Almost black brown hair: burnt umber, pthalo blue and a little permanent rose. Glazing and dry brushing are great for suggesting realistic hair. Such painting techniques are explored on my articles via the links below and also via the links on this site navigation. 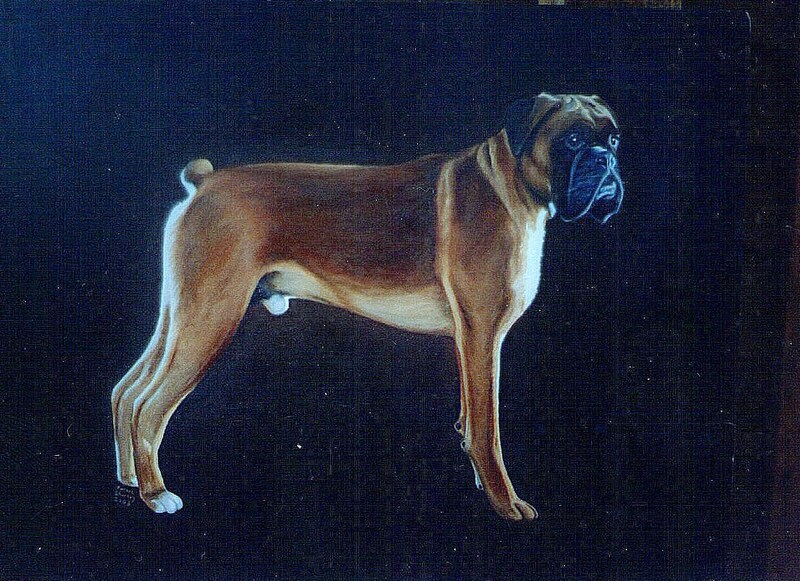 The artist who strives for realism may feel dissatisfied if a painting of a dog or portrait looks cartoonish. Mountains or rivers appear look cut out, shadows resemble dark smudges and flowers idealised. How does the artist create paintings that look convincing? The sky is blue, all chairs have four legs, all fingers are long, children are scaled-down versions of adults, all shadows are dark, snow is white, the grass is green and all eyes are almond shaped. When it comes to what the eyes sees, the above is often not true: Skies can be silver or indigo, chairs can appear to have three or two legs, fingers may appear stubby in foreshortening, children have different proportions to adults, snow can appear blue, shadows can be orange, grass can be violet and eyes can be lots of shapes. These are simplified examples, but the dictatorial part of the brain may interfere with the painting process in very subtle ways which the artist may not always be aware of, such as how a line curves or the chromatic shift of the sky. What is the solution to this dilemma? The theory is simple, the practice is more difficult: Shut off the dictatorial part of the brain. This will help not only the painting process, but the whole business of creating realistic art, including drawing, pastels and watercolours. View the subject matter in front as abstract shapes and lines rather than what it is. A cup is no longer a cup, but a jigsaw of colour and tone. Half-closing the eyes will help simplify this jigsaw. Ensure also that the photograph is good quality. Lack of visual information will force the artist to fill in the gaps. Keep looking at the photograph or subject matter in front. Not doing so means relying upon memory and the memory is the enemy of realistic art. Memory is where the dictatorial part of the brain takes over. If copying from a photograph, turn the photograph and painting upside down. Stand at least ten feet from the painting periodically. This will help the artist appreciate the painting as a whole rather than in its parts. View the painting through a mirror. This will reveal hidden errors in the painting. Take half an hour’s break from the painting and return with a fresh view. Working on a white surface will mislead the artist on the true tonal values of colours. Pale blue for instance will appear dark by comparison. Work on a toned ground. This entails the application of a thin wash of oil or acrylic paint over the painting surface, which could be grey or brown. This will kill the off-putting white and give a more accurate indication of the colour’s tonal value. I always include all tonal values in my paintings from pale to very dark to prevent the artwork from looking insipid or washed out. Overriding the dictatorial part of the brain will take the artist a long way towards creating realism. However, the artist may use art techniques to achieve a high finish. 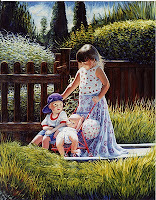 A combination of oil painting glazing and fine detail will create a photographic painting. Smooth effects can be achieved by applying two or three translucent layers of oil paint for skies or backgrounds for instance. A broken glaze can be applied for skin tones and dog fur. A few touches with a fine sable will create realistic hair and highlights. A good range of oil colours that include the primaries. Cadmium yellow (pale), permanent rose and pthalo blue are close to the mark. Other essential pigments are: titanium, ultramarine, cadmium red, burnt sienna, burnt umber, lemon yellow and viridian. Good quality fine sables such as Kolinsky. Winsor & Newton or Daler Rowney are good manufacturers of sable brushes. Linseed oil for thinning the oil paint to glazes. There is more to achieving a high finish to oil painting than this article can cover, but the links below will explore glazing techniques and producing high detail in painting, as well as articles on this blog. The artist striving to paint impressionist style may agonise over every brush mark, robbing the painting of expression and defeating the object of painting Impressionist. How can the artist create expressive paintings? Before tackling the problems of the fastidious artist striving to produce an expressive oil painting, the following practices may be identified. Sitting too close to the painting, causing each brush mark to appear to have more significance than it actually has. Using fine sable brushes throughout the painting session. Sitting in one position during the entire painting session or not viewing the painting in any other way. Painting onto a white support, causing pale colours to appear dark by comparison and resulting in a pale painting. Over-mixing the colours until they are completely even. Not using vibrant colours or tempering bright colours with browns and greys. Overworking the painting until it looses life. When striving to emulate the Impressionists, the following painting practices may be followed. Use only hog brushes no smaller than no.6, to force the artist to use economy with brush marks and avoid linear detail. Use every tonal value from pale to very dark within the painting. Working on a toned ground, such as grey or neutral colour, will give the true tonal value of each colour. Don’t use black to darken colours but the opposing colour. Red for instance, can be used to darken green. Don’t over-mix colours. Allow colour streaks to remain on the brush on application. Get up and view the painting from a distance. Turn it upside down or through a reflection to reboot the brain on what is vital about the painting and what is irrelevant. I believe every painting is allocated a limited number of brush marks before it becomes overworked. Make every brushstroke count. Allow imperfections to remain within the brushstrokes, and as soon as the artist starts to “fuss” over the painting, stop. Don’t be afraid to use colours neat from the tube. Juxtaposing them against neutral colours will make them appear more vibrant rather than cheap. Monet’s sunsets, for instance, contained lots of neutrals which provided the stage for the bright colours. 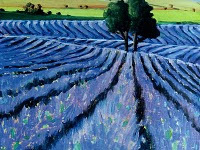 In my Youtube clip below, I used bright violets and blues on the lavender fields. Notice the contrast against the yellows and pinks in the background. To create focal points in colour, place contrasting colours against one another. Sunlight and shadow, for instance contains warm and cool colours; shadows often contain blues and violets, and sunlight, creams, ochres and oranges. Furthermore, working onto a bright coloured ground will create contrast with the colours laid on top. To make the painting appear to shimmer, as was the case with some of the Post Impressionist paintings, allow some of the ground to show through in places. 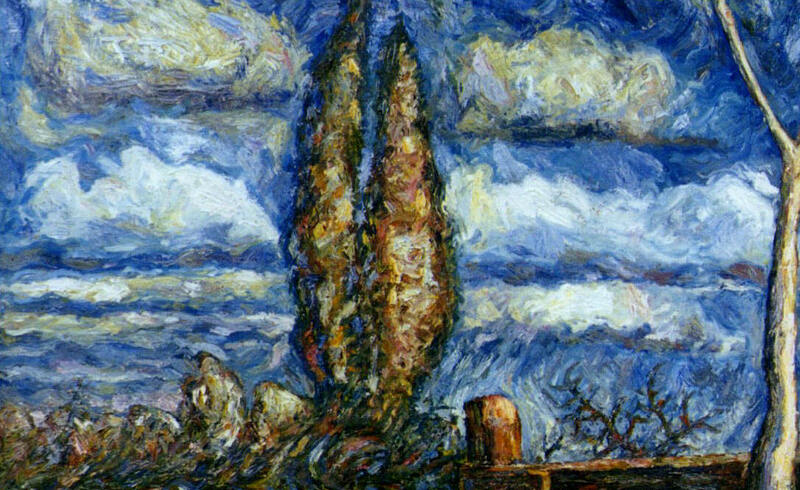 The artist who ventures into oil painting impasto may paste the oil paint on thickly for impressionist skies or landscapes, using up lots of costly oil paint. The result is that there is little of the paint left in the tubes for another painting. How can oil painting be made cheap when using impasto? Producing an oil painting with impasto paint can work out expensive if the artist is wasteful with oil paint. This can be a problem if using a palette knife or wide bristle brushes for relief effects. The following practices could make impasto techniques costly. Using exclusively artist quality oil paints and applying liberal amounts over the oil painting to produce relief effects. Depositing liberal amounts of oil paint onto the artist’s palette and then simply disposing of the residue at the end of the painting session. Putting too much oil paint on the palette in relation to the size of the oil painting. For instance, if the impasto work is small. Few artists wish to worry about how much paint to use when working in impasto, for impasto techniques are all about freedom of expression with paint. A great technique when working in alla prima, impasto can suggest energy and give vibrancy to large expanses of an oil painting, such as skies, water, seascapes, mountains and even backgrounds to still life and portraiture. But how can the artist make the oil paint go further with impasto? Here are some tips on making applying impasto paint effectively. Avoid depositing large amounts of a pigment onto the palette in the first instance, for surplus paint cannot be placed back in the tube. It is better to squeeze out a little at a time rather than one big splodge. Don’t dispose of the left over oil paint on the palette at the end of the painting session, for the medley of colours can be mixed to make lovely neutrals for a future painting. Place a Tupperware lid over the palette and seal with cling film. If placed in a cool place, the paints will remain workable for up to a week. Again, don’t throw away old oil paints, regardless of how garish the colour; they can be used to create bulk to an existing mix or used to mix neutrals. Allow some of the oil paints to thicken on the palette over a day or two. This will result in a thick, pasty consistency, ideal for impasto. A large impasto painting may benefit from the purchase of impasto medium or Oleopasto. This is an alkyd based medium that can be mixed with the oil paint to thicken the paint and make it go further. Impasto medium is often sold in tubes, and when squeezed out, a brownish substance will emerge. Once mixed with the pigment, it will not affect the colour, but will thicken the consistency of the oil paint. Mix to about one parts to four. Adding too much may take the tinting strength from the oil paint. 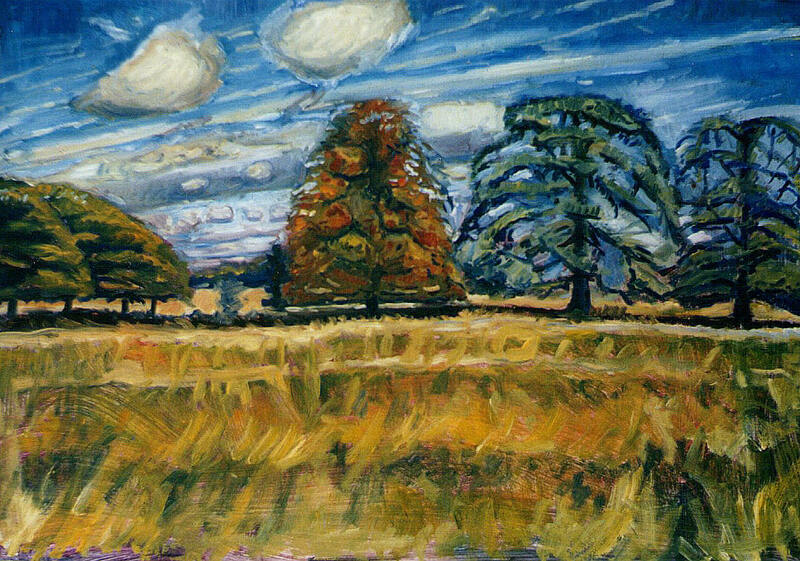 The impasto mixture can then be used for palette knife techniques or Sgraffito with textures. 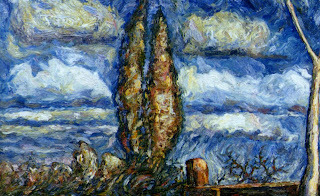 Impasto techniques with oil can be made inexpensive with a few adjustments to how the artist applies the paint. Avoid throwing out old tubes of paint for these can always be used for future mixes. Surplus paint on the palette can be saved for a future painting by sealed under a cover and placed in a cool place. Impasto medium can be mixed with oil paint to thicken its consistency and make it go further, helping to cut the cost of oil paints. Since posting this article, have created a Youtube clip on using impasto medium and palette knives to paint a Cezanne painting entitled the Great Bathers. An oil painting of water may look more like warped sheet metal rather than liquid. Bright blue or slate grey interspersed with black intended to represent ripples on the water’s surface may spoil an otherwise vibrant landscape painting. 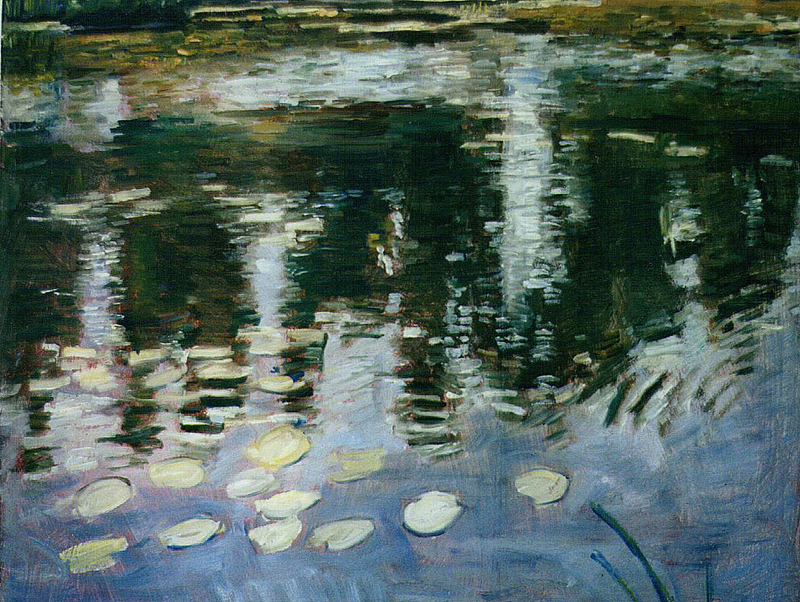 What can the artist do to make ripples look convincing in oil painting? Giving in to the dictatorial part of the brain that insists upon rendering what the brain knows about ripples rather than what the eye sees. For instance, all ripples are circular in shape, they appear elliptical from an oblique angle; each concentric circle moves outwards at equal distance from an epicentre and become less defined as it moves outwards. Employing the following chromatic rules will also result in unconvincing ripples. Darkening the predominant colour of the body of water, be it blue or grey, with black to illustrate the shaded side of each ripple. Using white to represent the crest of each ripple. Illustrating the ripples in a linear fashion with a thin brush “drawing” the ripples rather than painting them. Rendering distortions on reflections in the water only where the ripples occur. Ripples are not always perfectly elliptical if colliding with other ripples or waves, causing further patterns, such as semi-circles, stripes, criss-crosses and all manner of complex forms. Ripples can be a multitude of colours. A bright day could create great contrast in their hues from very dark to white. In other lighting conditions, ripples may contain bright green, violet, creams and even crimsons. Ripples often do not have shadows, but a colour shift. 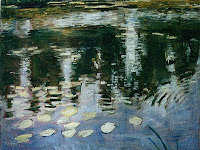 Agonising over every detail when painting ripples could result in a cluttered water painting. To achieve a broken, impressionist rendering of water, half close the eyes to simplify the view. Use a wide art brush and use bold brushstrokes as opposed to lines. Mixing colours accurately will help suggest water better than mere outlines. Work from mid tone outwards to darks and pales and take care not to let the darks contaminate the pales. I often apply the different tonal areas touching each other and then I knit the areas together with a soft clean brush. Soft blending is really the key to creating a suggestive painting of ripples. Don’t be afraid to use bright colours or deep tones if these can be seen. Finish off with the highlights, which may be applied with neat white paint. Another technique is to work in glazes. Work as described above, but smooth out any brush marks. A soft clean rag often does the trick. Don’t worry if the painting looks imperfect. Allow the paint to dry and then apply an upper glaze. A mixture of thinned paint works to smooth over imperfections or modify the colour beneath. Detail can be applied on tops with a fine brush. Create focal points by working on selected areas of the painting rather than all over, such as a reflection of clouds or highlights. Any colour can be found in ripples, but I find the following colours can be used for the base colour of water: ultramarine blue, pthalo blue, permanent rose, cadmium red, viridian green, lemon yellow, burnt sienna, burnt umber and varying amounts of white. Viridian, pthalo blue and white will provide the aqua tones of a Mediterranean scene; pthalo blue, burnt umber and white can be used for an overcast Scottish Loch. Permanent rose or burnt sienna will add warmth to the water, but pthalo blue will cool the colour. A dog portrait otherwise beautifully painted could be ruined by a slapdash background consisting of dung brown or a cluttered backdrop full of unwanted focal points. What can the pet artist do about backgrounds to a dog painting? Faithfully copying the dog painting from a photograph that features a cluttered background that draw the eye from the dog such as furniture or toys. Using flash photography for the dog, resulting in a bleached-out version of the animal. Against a dark background, the dog’s face will appear cut out and two dimensional. Applying paint over the background area as through glossing a skirting board, using one colour and uniform strokes. Using a pigment that is similar in tone and hue to the colour of the dog such as a beige background for a greyhound, or a chocolate brown background for a Doberman, resulting in colours that sit uncomfortably against one another. There are several ways the pet portrait artist can paint a background that enhances the dog. The following tips might help. If the photographic reference has lots of clutter in the background, edit ruthlessly. A small detail can be effective at creating a sense of space where the dog sits, such as the corner of a mirror on the wall or a chair. Less is often more when it comes to backgrounds. There is nothing wrong with using one colour in the background for a dog portrait, for this will add a classy touch to the painting that echoes of the old masters, but don’t use one colour for the whole area. Alter the tone or colour from one area to the other or leave expressive brush marks. Using a contrasting tone to the pet will bring out the colour of the pet’s fur or eyes. Dark forest green or rich browns will enhance a snowy poodle; pale smoky blues or eggshell will bring out a black Labrador. Similarly using a warm coloured background will bring out bluish highlights found in black fur, or using a midnight blue background will contrast nicely with the rustic colours of a Yorkshire terrier. A dog that has a variety of tones, such as a Dalmatian, would benefit from both approaches. I personally use a dark background to bring out the pales on the dog’s coat. Rather than paint straight onto a white canvas, apply a thin wash of a neutral colour to gain a more accurate idea of the tonal values of the pet. This will prevent the dog portrait from looking washed out when the background is blocked in. A lively impasto effect can be achieved if applying brush marks or broken glazes on the background to leave it looking unfinished. This will contrast with the high detail of the dog. Another approach is to apply paint in thin glazes to achieve a smooth finish to create contrast with the texture of the fur. Glazing entails mixing the oil pigment with a little linseed oil to make the paint translucent. Once dry, the next glaze works to improve upon or deepen the underlying hue. Rich browns, rusts and indigos can be achieved by glazing with oils and helps to create a professional finish to the dog portrait. Using a contrasting colour or tone to the dog’s fur and eyes will make the dog stand out in the painting. Cut the clutter from the background and avoid using a flash for pet photography. Impasto effects are great for creating contrast to a detailed dog painting, but a smooth glaze will create a high finish resonant of the old masters. What do I do With the Backgrounds to My Portraits? An otherwise successful portrait painting could be spoiled by a background that jars with the subject matter. An element placed in the background may create an unwanted focal point in the painting, or a garish colour makes the portrait look amateurish. What is the best background for portraits? Understanding the causes of unsuitable backgrounds to portraits, or indeed pet portraiture, may help improve future portrait painting. The following practices could be the root cause of a portrait ruined by the background. 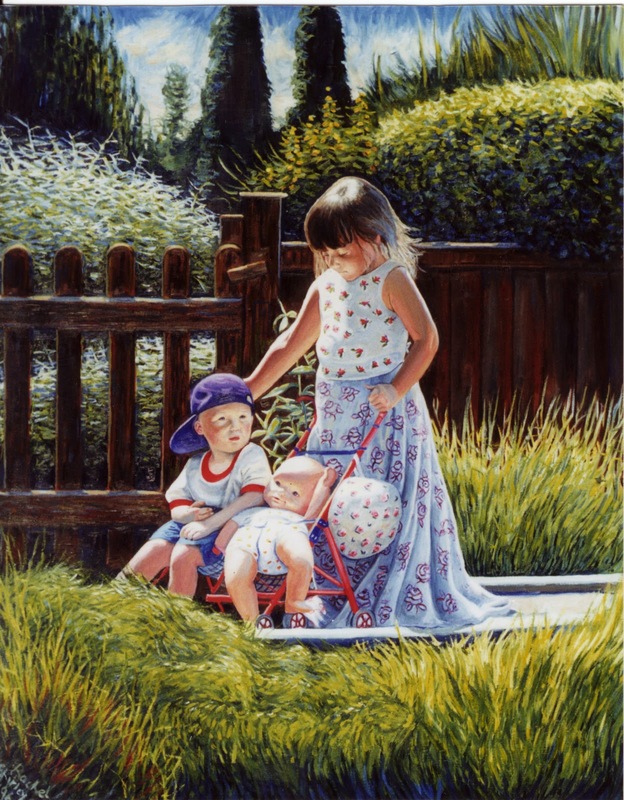 Using photographic reference that includes incidental objects in the background, such as part of a washing machine or a van parked in the driveway, and simply copying them exactly in the painting without artistic editing, resulting in a portrait cluttered with unwanted focal points. Selecting a background colour that is slightly different to the portrait sitter’s clothes, hair or skin, such as pink and red; orange and pink or purple and blue causing unwanted conflict between two colours. Selecting a harsh or garish colour, such as yellow, bright green or orange and pasting it around the portrait, resulting in a background that appears to advance at the viewer and the portrait to recede or appear too faint. Using a flat colour and over-smoothing the paint over the background as though emulsioning a bedroom wall until it has a uniform quality without any life. Guess-working how a sitter’s shadow may look is it falls on a wall behind the figure, resulting in an ugly dark patch behind the portrait. 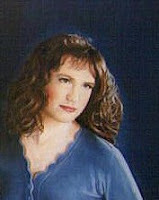 Think about the background to the portrait before embarking on the portrait painting. One of several approaches can be tried. A photograph that has lots of elements in the background can easily be edited by cutting. Simple is often more effective. A corner of a window, a splash of oblique sunlight on the wall or part of a lamp gives some context to the portrait and add atmosphere. Featuring a complimentary colour or hue within the background to the sitter can be effective. Smoky blue, cool brown or forest green will bring out the warm flesh tones of a pale person. Cream, china blue or cool mauves will compliment Asian skin tones. Consider the colours of clothing in similar fashion. An empty background can be charged with artistic energy with broken colours and brush marks. Avoid directing all brush strokes in the same direction, such as vertically. Move the strokes around the figure to give the figure some presence. Tonal gradation or from one colour to another can create dynamism. I often use a paler colour or a complimentary at one upper corner of the portrait, and then darken or modify the colour towards the adjacent bottom corner. Painting the portrait onto a white surface will give a misleading impression of the tonal and chromatic values of the portrait. Apply a neutral glaze, such as mid-brown or blue to the painting surface before embarking the portrait. This will help the artist get a better idea of the sort of colours that will go best with the portrait and prevent a washed-out looking portrait painting once the background has been filled in. Muddy colour mixes may appear from nowhere when trying to mix red and yellow for trees or blue and red for flowers. Grass’s green has a brownish cast; pansy heads look almost black rather than violet, and sunsets look tarnished. What can the artist do to avoid dirty mixes when combining primary colours? Understanding the causes of dirty colour mixes will help prevent dirty looking paintings in the future. The following bad practices will most certainly be the causes of unexpected colour mixes. Not understanding colour theory properly. Following a colour wheel diagram that does not display the true primary colours. Using the mixture of any red, yellow or blue to mix green, purple or orange. Having insufficient pigments in the artist’s arsenal to produce the desired colour mixes. Just because an oil pigment is labelled “blue,” does not mean it is a primary colour. Ultramarine, for instance, has a lot of violet in it. Cerulean has a greenish tinge. In fact, no pigment is truly a primary colour, as impurities will exist, however small. Only a close approximation can be achieved. However, I have found Pthalo blue to be close to primary blue and include it in my colour palette. Take the other counterpart in a purple mix, red, and here lies the same problem. Many pigments are considered “red,” including cadmium red, vermillion, crimson lake, alizarin crimson and permanent rose but not any “red” is a primary colour. Cadmium red has a lot of yellow in it and alizarin has a violet quality. Again, I have found permanent rose to be closest to a primary red, as it is similar to the “magenta” of printing ink. Since cadmium red is biased towards yellow and so is cerulean blue, the mixture of this “red” and “blue” will collectively have a lot yellow in it. It would really be like mixing red, yellow and blue rather than just red and blue. Small wonder if the mixture turns out brown or grey rather than purple. The same problem arises when mixing ultramarine, which has a violet cast, with cadmium yellow, which has an orange bias, to get green. The result turns out a brownish green. What are the Primary Colours of Oil Paint? I have found pthalo blue , permanent rose and cadmium yellow (pale) are pretty close to pure primary colours, although small impurities will still exist. Pthalo blue and lemon yellow will produce clean greens, although viridian will add a little punch. Pthalo blue and permanent rose will produce deep purples, although, substituting ultramarine for pthalo blue will result in warm purples (as it contains violet anyway). So to avoid getting brown rather than purple, avoid using reds and blues that are biased towards yellow. The following pigments are either biased towards each other (ie have a violet cast in them) and will produce a variety of interesting purples, violets and mauves, or are almost a true primary colour. Pthalo blue, Ultramarine, Winsor blue (red shade), Prussian blue, permanent rose, alizarin crimson and crimson lake. Quinacridone violet might add some punch. Trying to paint glass in a still life may seem impossible for its elusive quality. The artist strives to make glass look solid, and yet it is partially invisible. In other cases, the artist may struggle with reflections and shadows on the glass resulting in a glass painting that look confused. How does the artist make glass look real? 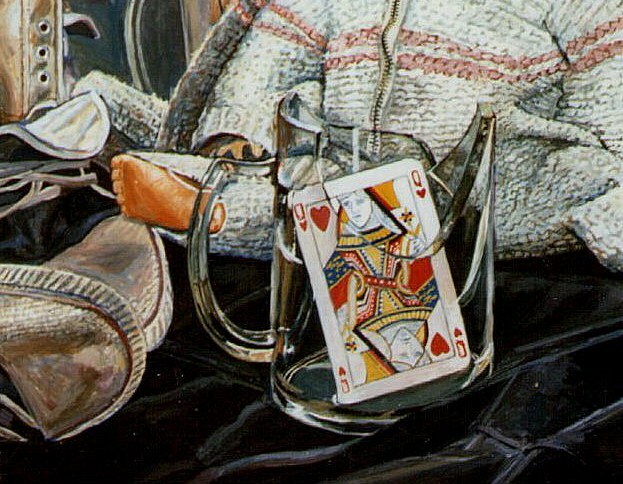 Subconsciously making the assumption that glass is completely transparent, and painting the objects seen through the glass without altering the palette. Not taking into account for refractions or distortion of the objects caused by glass, causing the artist to paint the objects as though seen through a flat plane of glass rather than one with contours. Outlining the glass with definite dark lines. Using neat white for reflections and highlights. Reflections on the glass’s surface, such as windows, people or furniture. Shadows cast on the glass from neighbouring objects. The glass’s own shadow which appear solid on some places, ethereal in others. Refraction of the objects seen through the glass causing them to appear displaced. Imperfections on the glass’s surface, causing warping or distortion of the appearance of objects. The colour of the glass itself, which may appear translucent in some places, greenish, bluish or grey in others. With so many elements to consider simultaneously, it is small wonder that the beginner may feel trepidation at the idea of painting glass. The secret to painting glass is simply to simplify. Forget about the different elements and what the brain knows about them, but to simply paint what the eye sees. This may seem difficult at first, but practice will make perfect. Try the following tips. Paint glass from a photo at first. Painting from a two dimensional image will take away the concept of the space the glass occupies and the changing lighting conditions. Turn the photo upside down in order to make it appear more abstract. Pay attention to how objects are seen through the glass. Do they appear displaced? Are they warped? Look out for distortions of the objects through the glass. An object with a straight line such as a playing card may appear curved or have wobbly lines. Contours will often steepen towards the edges of the glass, and may appear to disintegrate altogether. The palette of objects will often have tonal and chromatic shift when viewed through glass. Some may have a greenish or mauve cast which will appear richer through thick glass. The tone will often be (but not always) darker. Not all reflections and highlights are white or grey. Look for other colours, such as violets, creams, beiges and blues. Never use black to darken a colour but a complementary (an opposing colour). Darkening bottle green, for instance can be achieved with the introduction of a little crimson. The shadows glass casts has a diverse quality; dark in some places invisible in others. Use a soft brush to blend areas that gradate from pale to dark. Light sometimes refracts through glass creating bright spots and odd patterns on surfaces almost like water. Exploit these to capture the essence of glass. Dark deep and vivid colours often intimidate novice artists causing a diffident approach to painting. The resultant artwork lacks tonal variety, biased towards pales or insipid colour mixes. 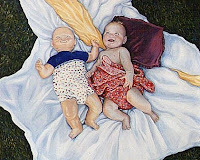 More often than not, the painting is difficult to discern from a distance. How can the artist get the confidence to use vivid colours in oil painting? The following problem areas are usually at fault when faced with colour mixing with oil paints for the first time. Working too closely to the painting often leads the artist to believe that small marks have more significant when viewed from afar. Using a fine brush when working over a large painting will also lead to a painting filled with small and insignificant brush marks that cannot be discerned from a distance. Painting straight onto a white surface will make even the palest colour appear dark and deep by comparison. Working under a bright light will exacerbate the effect as the light bounces off the white surface of primed canvas, for example, making any colour, however pale, seem to have great significance and misleading the artist on its true tonal value. Painting a white object such as snow, a snowy-haired pet or clouds may often send a subconscious message to the artist that the object is white, getting in the way of viewing the object honestly. The result is the automatic reaction of using lots of white paint. Capturing objects in a painting not only entails observing its colour, but also its tonal value. However, painting bright coloured objects such as tomatoes may lead the artist to forget about tones. Some colours are also presumed to have a darker tone than others, such as blues being darker than yellow. In fact, any colour can be darker or paler than another. Yellow can indeed be darker than blue; purple can be paler than orange. To overcome wishy-washy colour mixes, try painting onto a tinted surface rather than white. An imprimatura is a thin wash of paint that kills the whiteness of the painting surface. I use acrylic, although oils will do. Acrylic dries water-soluble and quickly. Grey, neutral or earth colour is ideal for gauging the true tonal value of a particular oil pigment when it is applied on top. Applying a pale colour onto a tinted surface will look pale rather than dark. Working from dark to light will also force the artist to examine the true value of pale colours. This entails painting onto a black surface. Applying mid-tones before the pales is a good practice for artists learning about tonal values. You can also make an oil painting shimmer by painting onto an imprimatura of a contrasting colour to the painting itself, such as painting a picture of a green meadow onto a red imprimatura. See my Youtube clip showing two women's faces from Gustave Courbet's The Sleepers. The painting was begun with a violet underglaze, which was overlaid with a richer, deeper indigo. Notice the colors on the flesh contain very rich pigments, including pthalo blue, burnt umber and alizarin crimson. 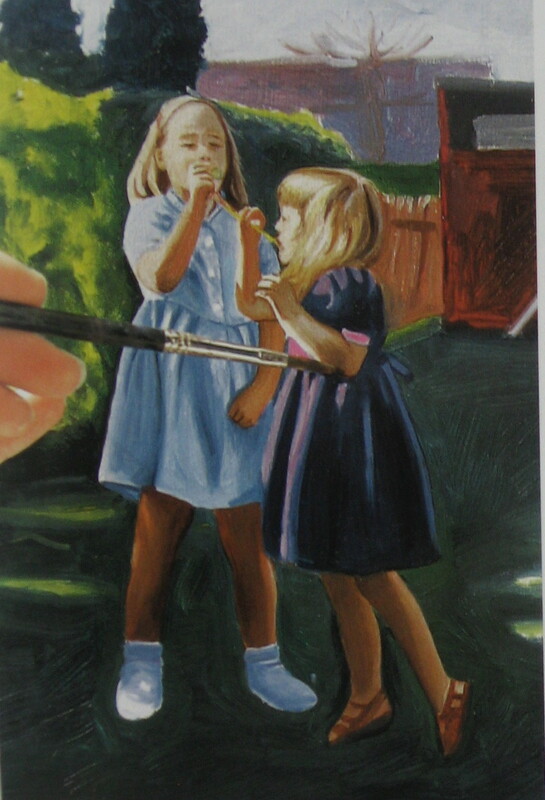 This meant the skin tones could stand up to the the deep-colored background. Without using such rich colors, the women's faces would appear pale and washed out. The following tips on producing vibrant oil paintings may help the artist take chromatic risks and get out of the trap of mixing insipid colours. Try to include all tonal values in the painting, from white to very dark. Half close the eyes in order to see a colour’s tonal value. Darken it with the colour’s opposing colour rather than black. In the case of blue, this will be orange. Stand back from the painting to gauge the true significance of each brush mark. Using a wider brush than one thinks necessary may force the artist to use bold brush marks and take risks. Pay attention too to the tonal key of the painting and setting. If an object is brightly lit as on a sunny day, it will have high contrast and colours and will appear more dazzling. Even lighting such as overcast will produce a setting with a low key, which will consist of mid tones and neutrals. Painting white fur may compel an almost knee-jerk reaction of titanium white overkill on a portrait of a dog, cat or horse. The result may turn out to be a two dimensional cut out impression of the animal. How can the pet portrait artist paint white fur. Exclusively using white paint or very pale colour mixes to illustrate pale fur, resulting in a washed-out pet painting. Using poor photographic reference of the pet, particularly flash photography that results in a bleached-out image. Darkening pale fur with black oil paint for shadows, resulting in dirty dead greys. Illustrating contours as dark lines, creating an illustrated effect that does not convey the true softness or texture of the animal. Illustrating each hair as a white linear brush mark of equal thickness and tone, resulting in a uniform and artificial appearance to the fur. Good photographic reference is crucial (for pets have a habit of moving about unless asleep). This is especially important for a pet of one colour, such as black or white. Natural daylight is best. Only use flash photography as a fill-in to soften harsh shadows. Avoid taking the photo into the light. I find side-lit effective at capturing the contours of a dog’s face, for example, which will reveal its character. Get as close up as possible and take several photos to increase the chances of obtaining one that really captures the essence of the pet. What Pigments Should I Use for White Fur? The artist must override the fact that a pet is white before trying to paint white fur. The following tips may help achieve a convincing portrayal of a fluffy white pet. I ban black for it deadens neutral colours, but delicate tints can be achieved with the addition of the following colours with white. White and burnt sienna creates rich creams for warm highlights; white with a dab of pthalo blue produces arctic white; white with ultramarine and a little burnt umber creates dark indigos for cool shadows; white with a dash of pthalo blue and permanent rose creates delicate mauves, and with a little burnt umber creates rich neutrals. Never paint a white object onto a white painting surface or its tones will be difficult to judge. Apply a mid-toned imprimatura onto the painting surface first. I would recommend a thin wash of neutral-coloured acrylic paint. This could be a mixture of blue and brown or grey. Once dry, I transfer the drawing onto the surface using a chalk pencil. Begin with the mid tones and work outwards to the darks and pales. Take care not to contaminate pales from a neighbouring dark colour. View the areas of light and dark as abstract shapes rather than part of an animal. Turn the photo upside down to retain the abstract appearance. Glazing is a great painting technique for emulating rich soft fur. Glazing entails applying oil paint in translucent layers. Soft sables are essential; Kolinsky sable size 1 for detail, 3 for blending and 6 for smoothing larger areas. Block in large areas of tone and colour first. Don’t worry about detail at this point for the next glaze can be used to smooth imperfections. The other secret to painting soft white fur is blending. With a soft clean brush, knit together harsh colour divisions. Keep wiping the brush on a rag to avoid the paint from building up (avoid swilling it in spirits or the paint will be too runny). Using paint neat can be controlled more easily and when dragged over the painting surface with a thin brush, will appear almost like a pastel pencil, great for soft effects such as fur. Remember to move the brush in the direction of the fur’s growth. It is not necessary to apply equal detail all over the fur or it will look flat. 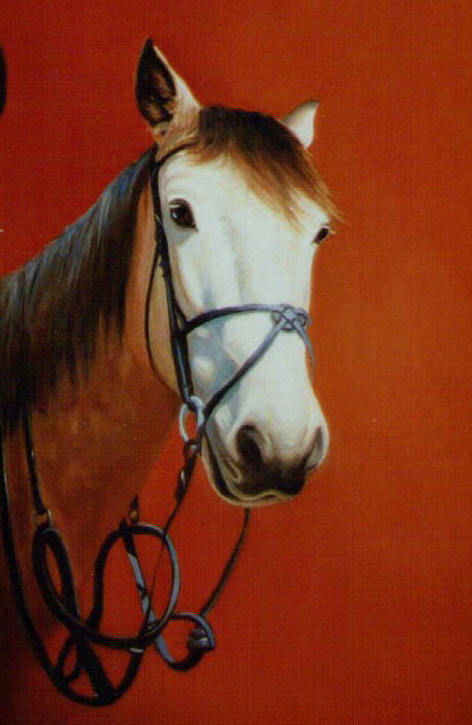 Apply detail to focal points only, such as the highlights, the nose or fur around the eyes. Suggesting flyaway fur will create more realism. Dragging thin paint as described earlier to suggest hair around the ears or tail will make the pet look more stroke-able. Finally, not all fur has the same appearance. Some will look finer than others, and again, will follow different growth patterns.